If backflow occurs, it can be terrible for your plumbing, and for your health. So a backflow prevention device it's an extremely important part of any home. Back flow can contaminate your water supply, and that can obviously be a very serious problem. Backflow preventers are devices that can stop any of the sewage of your plumbing from backing up into your other piping systems. At Cooper's Inc., our plumbers can help you install a backflow system that will be perfect for your home, eradicating any problems, or potential problems, that your home might have with sewage backflow. We can also help you maintain and repair any backflow prevention system. Backpressure is the reversal of water flow within a piping system that is caused an increase in the water used compared to the water supplied. This problem is much less common for homeowners to encounter, but it can be completely averted with the installation of high quality backflow prevention system. Backsiphonage is the reversal of water flow caused by an increase in the velocity of water use. 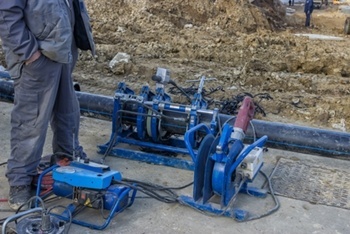 If you have aged pipelines, leaking sewer connections, or crossed-over connections, backsiphonage is a common problem to experience. The water flow is redirected back to other connections, which can a huge problem for homeowners. In order to fix backsiphonage problems, you'll have to go underground—often beneath the house—and remove the pipe that's causing the trouble. Our plumbers can help make sure that you never encounter this problem. We'll test the backflow problems in your home, then we'll help you install backflow preventers that are perfect for your plumbing system. If you need a backflow prevention device installed or tested in the Topeka area, please call Cooper's Inc at 785-267-4100 or complete our online request form.